Attached scan of the first 2 pages of the serialized debut of our favorite saga, Part 3. Some of the details of the parts 1 & 2 summarized in "THE PLOT" differ from the movie adaptation. In the novel Dr. John lives aboard a shanty boat and he has a girl friend named Miss Robbie. 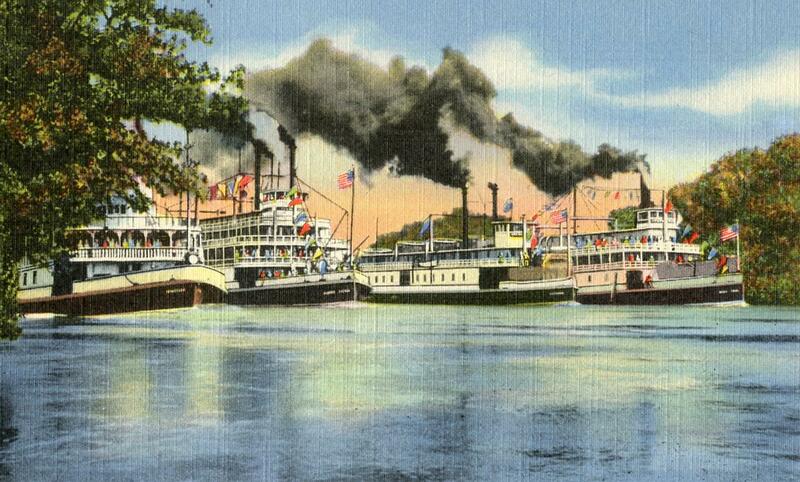 The steamboat John acquired is called the BAYOU QUEEN, in the movie it is renamed the CLAREMORE QUEEN after Will Rogers' hometown in Oklahoma. Detail of the double page spread on a the novel when it was serialized in several installments in the Pictorial Review, 1933 - 2 years prior to the making of the film. Note Fleety Belle is dressed pretty much like Anne Shirley was in the film. Attached 6 frames from the Steamboat Round the Bend Trailer for y'all. Will Rogers is holding a corn cob pipe and wearing a very sincere grin on his face. Here's the flip side of the Fetchit Rogers herald with a vertical "poster" heavily "screened" (with what became known as "Benday dots") and the contrast was hard to improve upon but it does look a bit better now than the original did. 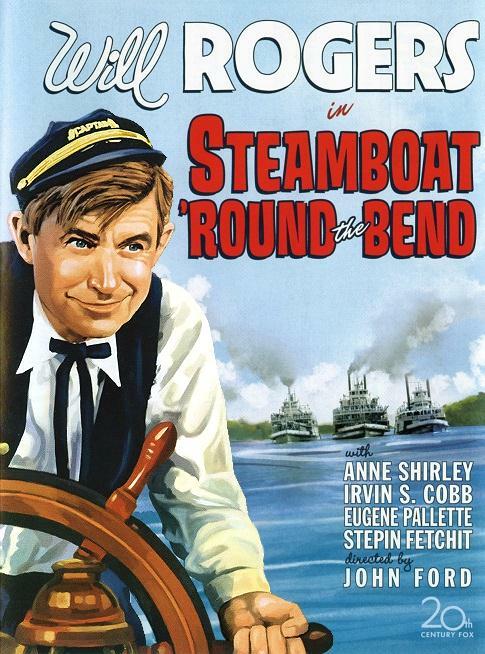 Steamboat Round the Bend "lobby card" . . . 11 X 14 inches is the total size with margins but didn't include them to conserve space. Below is the NY TIMES review for first release of "Round the Bend." Strangely there is no mention of the Sacramento River locations and the real-live steamboat in the exciting race. Instead it's more about the actors in the movies. I gather than 20th Century Fox got big box office receipts from this movie, in part because it was Rogers' last picture show. 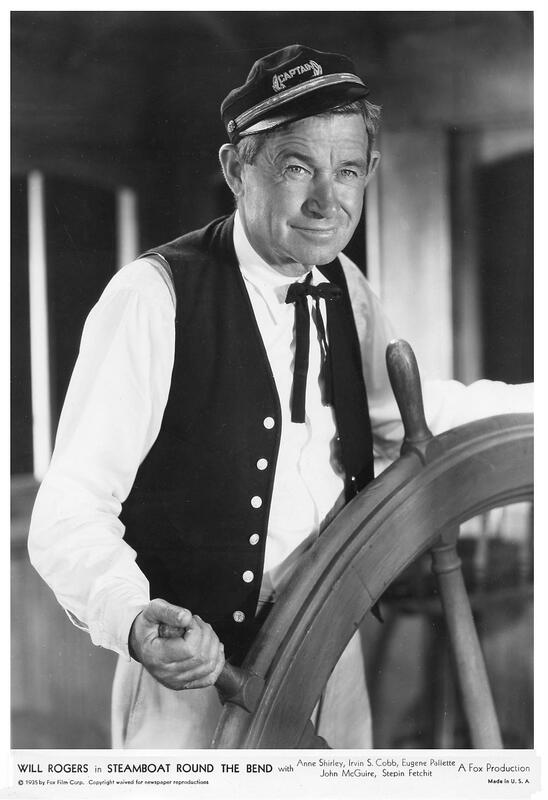 Will Rogers, in his posthumous screen appearance at the Radio City Music Hall, ambles happily through one of the vigorously American folk tales to which he brought so much warmth and native wit during his career on the screen. 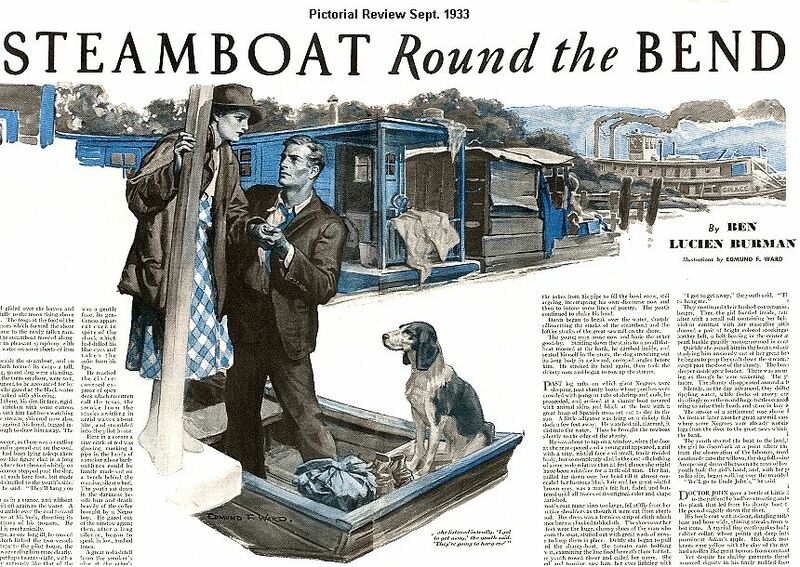 Immersed, like all the good Rogers films, in mood and atmosphere rather than the complexities of plot structure, "Steamboat Round the Bend" is in the rich comic tradition of Mark Twain and those great days on the Mississippi. If the photoplay is not the finest of Mr. Rogers's works, it is close to the top, and it finds America's favorite philosopher at his homespun best. With the assistance of Berton Churchill, Eugene Pallette, Francis Ford and a newcomer who calls himself Irvin S. Cobb, "Steamboat Round the Bend" emerges with merry success. Here Mr. Rogers is a kindly medicine man and proprietor of a rattletrap stern-wheeler who crowns a career of amiable chicanery by defeating Mr. Cobb and "The Pride of Paducah" in the great steamboat race. Among other things the film reveals that the business of hanging a man is not nearly the gloomy enterprise that its has generally been considered but is really alive with the spirit of good, clean fun. Doc Pearly's nephew, it seems, has killed a fellow in a brawl over a girl, and on the Doc's advice he gives himself up. Unfortunately, in the absence of the star witness for the defense, the judge sentences the culprit to the gallows. Hanging seems to have been a pretty trivial matter in those brawling days, and the photoplay is vastly effective in its description of the casual attitude that every one observes toward the lad's plight. One of his last requests, for example, is that he be permitted to marry his sweetheart. The marriage ceremony in the jail, with the Sheriff jocularly emphasizing the "Till death do us part" theme, and the witnesses growing shamelessly maudlin over the union, is one of the priceless comedy scenes of the season. For a sequence of comparable hilarity, you will have to go to the steamboat race in which the Doc pits his venerable hen-coop against the boat operated by the complacent Mr. Cobb. With a drunken engineer, a pompous minister of the gospel and Stepin Fetchit for his engine crew, the Doc stays in the race, but you will not learn here by what devices he manages to defeat his rival. Somehow, under the knowing direction of John Ford, the hanging motif continues to be funny even when the unhappy victim is standing on the scaffold with the noose around his neck. The Sheriff, you see, is anxious not to hurry the lad in his last moments, but at the same time he is itching to get down to the river bank to see the finish of the race. Luckily, the Doc has the star witness on board and he arrives in time to halt the ceremony. "Steamboat Round the Bend" is fortunate in its actors. Mr. Churchill, decked out in a white smock and silk hat, is magnificent as the holy roller messiah of the swamplands, who calls himself the New Moses. Mr. Pallette's bloodcurdling indifference to the plight of the condemned youth makes his performance as the Sheriff a thing of joy. Mr. Ford is equally effective as the alcoholic engineer who gives up the bottle under the exhortations of the New Moses, but finds comparable ecstasy in the Doc's patent medicine. As the forlorn lass who finds herself unable to share the general nonchalance over her sweetheart's predicament, Miss Anne Shirley reveals that delightfully whimsical innocence which was so engaging in "Anne of Green Gables." 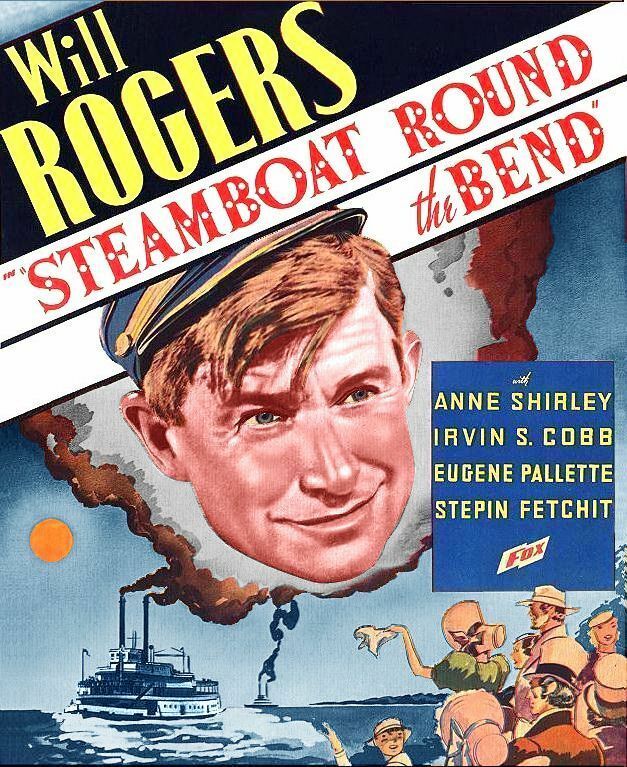 STEAMBOAT ROUND THE BEND, adapted from the novel by Ben Lucien Burman; screen play by Dudley Nichols and Lamar Trotti; directed by John Ford; produced for Fox by Sol M. Wurtzel. At the Radio City Music Hall. The is one side of a 2 sided promotional flyer called a "Herald," that was circulated to theatre goers for publicity purposes a a week or two prior to the release of a movie in a local theatre. 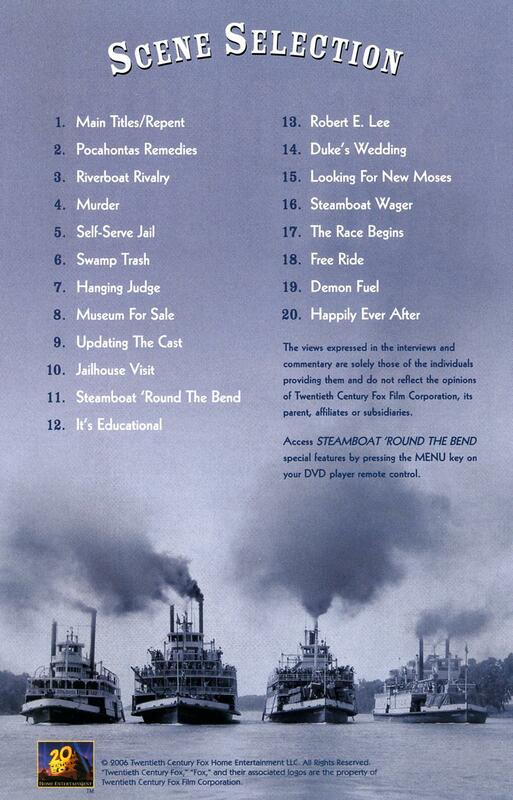 Attached DVD insert with those chapter names from FOX 2006. "I've stood just about all the insults I'm gonna stand out of you people. You can't come in here talkin' to that girl like that. That's Duke's wife. -Now get out of here, you swamp trash! -Come on, you swamp rats! Get out of here!" Another Steamboat Round the Bend still . . . the movie was called "Steamboat Bill" (after the popular 1911 song) in Great Britain so that's the name in the lower margin. The scene as it was stage here was cut from the movie. It takes place in the courthouse jail, apparently before Duke's trial. John McGuire as the accused "Duke" is a whittlin' as he sits on his cot next to Will Rogers as Doctor John Pearly. The "accusing finger" is being pointed by vulture-like character actor Raymond Hatton as Duke's worthless "defense attorney" Matt Abel (who the Judge held a personal grudge against) while Eugene Pallette as Sheriff Rufe Jeffers strikes an Odalisque pose on the bench far right. 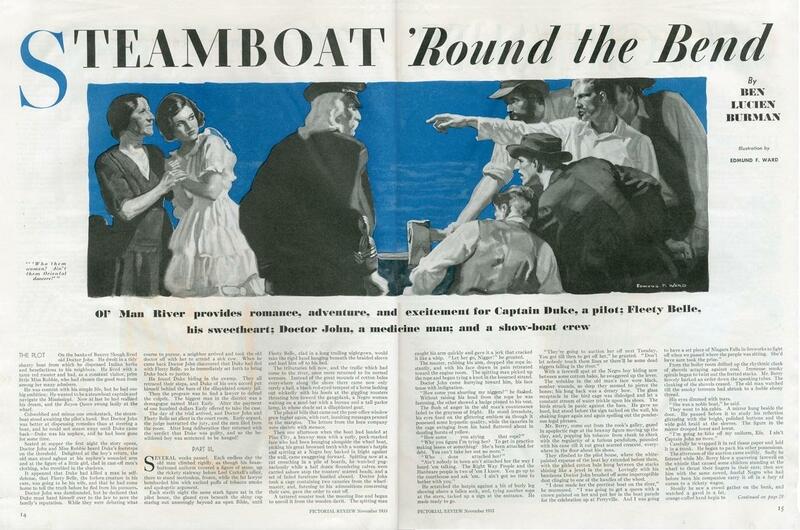 Witness an amazing steamboat race to save a life in this 1935 film directed by John Ford. 27 x 41 rare "one sheet" for Round THE BEND. I've never seen another copy of this one. Bought it from Collector's Bookshop on Hollywood Blvd in the late '80's. Artist's rendering from a photo of Rogers is the best thing about it. The young couple in the lower right don't really resemble Doctor John's nephew Duke or Fleety Belle the swamp girl. The steamboat is typical Sacramento River style which is distinctively different than the Mississippi River variety. Still an enjoyable epic and nostalgic farewell performance from America's beloved Will. 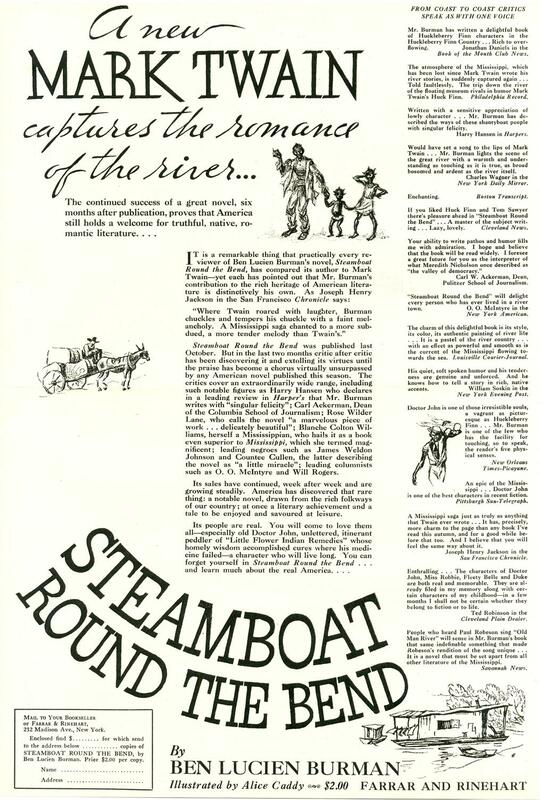 This is a scan of a magazine promo published 6 months after the novel Steamboat Round the Bend was first published, with rave reviews from critic. Included below a transcript of the text of the promo. The illustrator, Alice Caddy was the wife of Ben Lucien Burman who wrote the novel. I doubtful that modern critics would be as generous in their appraisal of the novel today. It's a novel that resonated in its time (the mid 1930's) and not an enduring classic in the same league as Sam Clemens' novels TOM SAWYER and HUCK FINN. Somewhere I read that Will Rogers himself bought the screen rights to the novel but I haven't confirmed that. 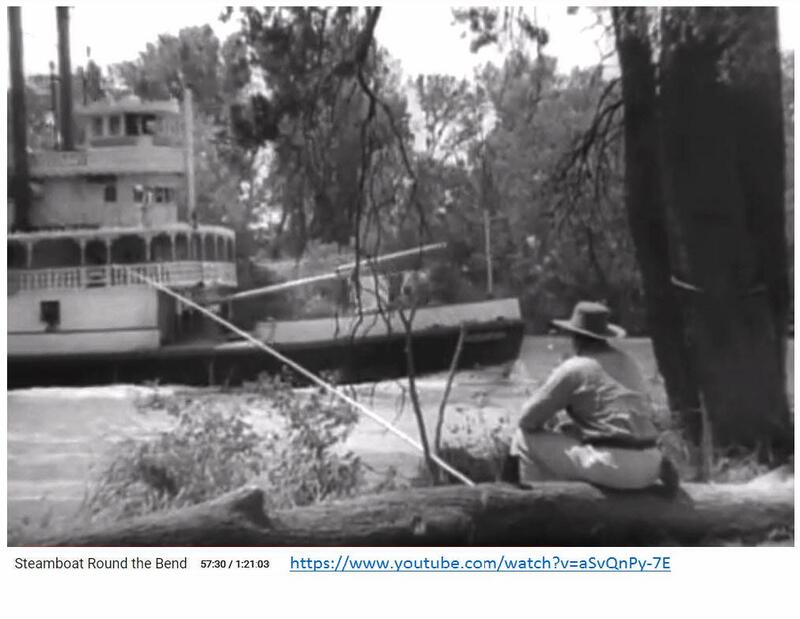 It could be that John Ford, the Director of the movie was the one who bought it and filmed it on the Sacramento River for the Fox motion picture studio. This is page 17 of Street & Smith's PICTURE PLAY Magazine, October 1935. Will Rogers had died a month and a half earlier on August 15, 1935 and there was a little reluctance at Fox Studios to release the movie but Rogers' fans clamored to see their beloved Will once more and the movie apparently did "big box office." Comedies were apparently often referred to as "laugh pictures" and director John Ford complained that producer Darryl Zanuck cut most of the comedy out of the SRB to make it more of a melodrama revolving around rescuing Dr. John's nephew Duke from the gallows. Would love to have seen the missing comedy scenes, doubt Fox saved any of that in their archives. It would be priceless today. 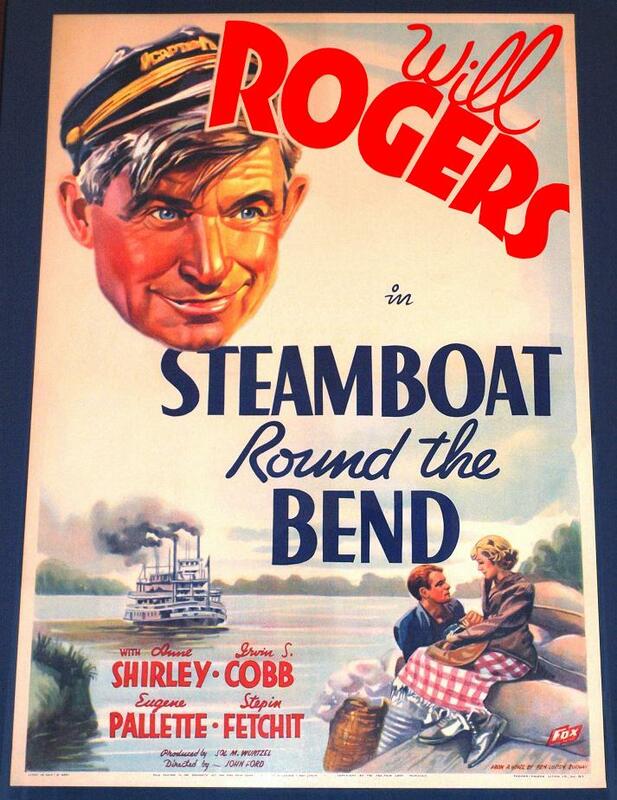 If I keep collecting STEAMBOAT Round THE BEND there will be enough for an entire site devoted to the movie. Fame is indeed fleeting. In the 1920's and 30's, Will Rogers was one of the best known and most loved American personalities. 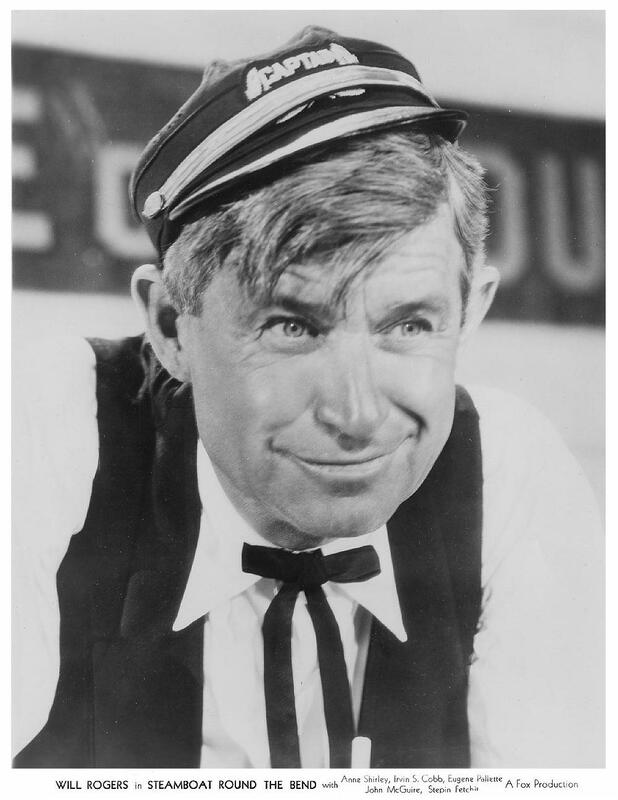 He charmed audiences with his rope tricks, witticisms, and homespun political satire (think Jon Stewart with a touch of Jeff Foxworthy); and he rose to entertainment's highest ranks in vaudeville, on Broadway, as a newspaper columnist, and eventually in the movies. Between 1918 and 1935, Rogers starred in 40 feature films and dozens of short subjects; and his movies were so popular that theater owners named him the number one box office attraction in 1933. Yet today his films are virtually unwatched and unremembered. In recent years, a handful of Rogers features have been released in DVD boxsets, allowing new audiences to discover the comedian. 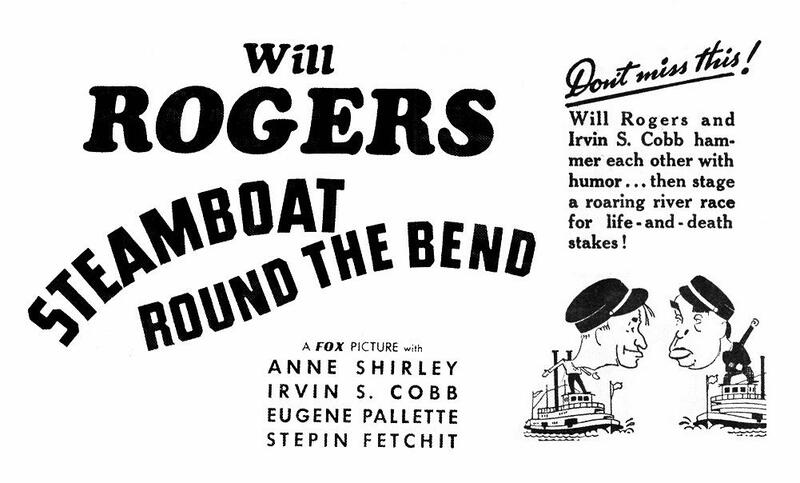 Amongst these releases is Rogers' penultimate film, Steamboat Round the Bend, which turns out to be more alcohol-fueled than the riverboat comedies of W.C. Fields, Tillie and Gus (1933) and Mississippi (1935). The film, set in the early 1900's, stars Rogers as Doctor John Pearly, a dealer of extremely alcoholic patent medicine. Doc decides to give up the booze-pushing business and buys a rundown steamboat, which he fixes up with the help of an engineer (Francis Ford) who is addicted to Pearly's potent brew. Pearly bets his fixed-up tub against the best steamboat on the Mississippi in a winner-take-all race, but he gets sidetracked when his nephew Duke (John McGuire) is sentenced to hang for murder. With the help of Duke's betrothed, Fleety Belle (Anne Shirley), Doc searches the river for the one witness who can prove that Duke isn't guilty, a prohibitionist preacher who calls himself "The New Moses." Can Doc and Fleety Belle save Duke from execution in time to win the big steamboat race? What do you think? 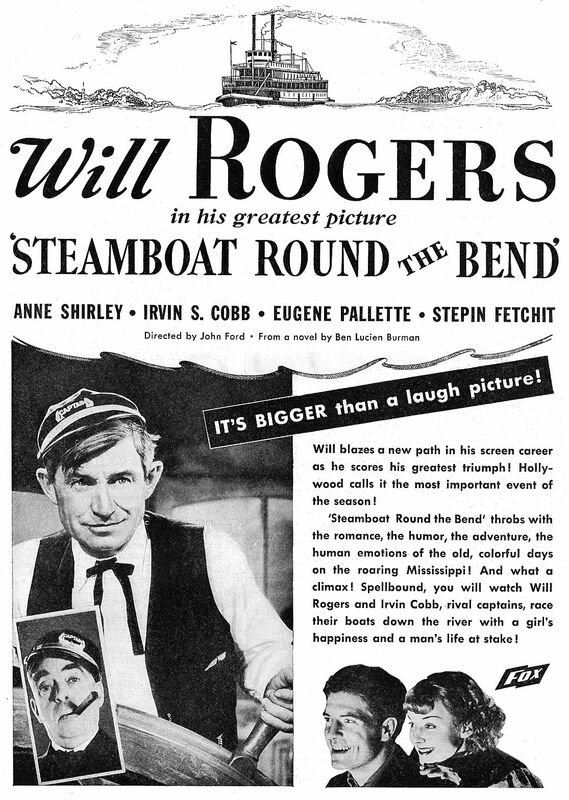 Audiences of the Thirties were drawn to Steamboat Round the Bend due to Will Rogers' celebrity (and due to morbid curiosity, as the film was released after Rogers' unexpected death in a plane crash), but the movie is of most interest to film scholars today because it was directed by John Ford. Although Ford was not a filmmaker noted for producing comedies, the film has a pleasant, easygoing style that meshes well with Rogers' homespun humor. This was actually the third film Rogers and Ford made together, and the partnership would have likely continued if not for Rogers' untimely death. While the film is a good introduction to Rogers' relaxed comic delivery, it is far from his best film. The movie is overstuffed for an 81-minute comedy, containing con-man patter, liquor-laced humor, murder, a few musical numbers, possible execution, revivalist preachers, and a big boat race. 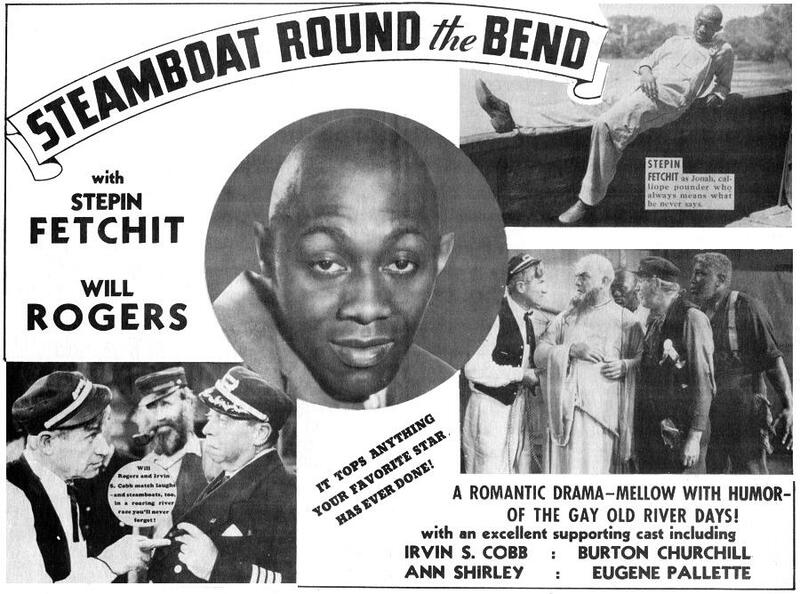 Modern audiences may also be turned off by stereotypical depiction of African-Americans, especially the character of Jonah, portrayed by Stepin Fetchit. However, it is important to remember that Will Rogers was fairly progressive for his day; and he insisted that Stepin Fetchit be hired as a supporting actor in his movies because they were good friends from his vaudeville days. 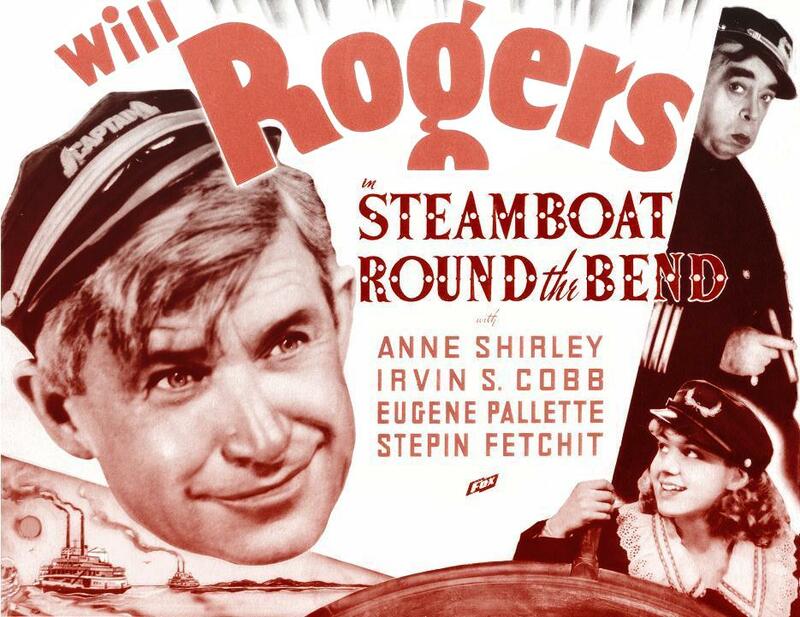 Will Rogers' comedies may seem a little too laid back for today's audiences, but if you come to Steamboat Round the Bend in the proper frame of mind, you'll find plenty to like. 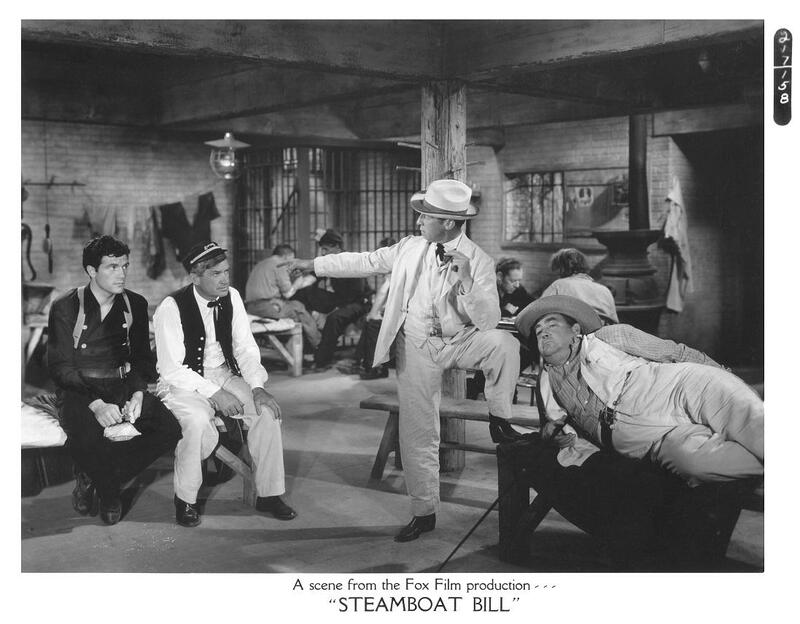 Especially fun are Francis Ford (the director's brother) as the constantly inebriated steamboat engineer and the film's climactic steamboat race, in which booze is used to win the day. NEW MOSES: Raise your right hand and take the pledge. Brother, what do I see in your hand? Don't be a hog. Cast the enemy away! Bury demon rum in the waters of the mighty Mississippi! Fling it away, I say! I swear henceforth, liquor shall never touch my lips. More images from Steamboat Round the Bend. This is from a "linen" post card made by "Pictorial Wonderland/Art Tone Series" circa 1940. The company may have licensed the image from 20th Century Fox although the copyright is under the name of Stanley A. Filtz, San Francisco. Stan the Man was probably only copyrighting this color version. Kaywoodie Pipes also ran an ad which used a color version of a photo of the start of the race with costumed extras in the foreground. I couldn't eliminate the vertical "linen" texture" which is distracting. The retoucher made some of the outlines on the boats bolder for legibility most likely. While vintage postcard collecting has always been very popular, one of the quickest rising interests in this hobby just might be collecting Linen Postcards. Linen postcards' obvious appeal is their artistic colorful style, multitude of subjects along with a relatively low cost. Linen postcards are easily identifiable by the type of high rag card stock they were printed on which was produced with a linen finish; a textured pattern distinguished by parallel and intersecting lines resembling linen cloth. The face of the card was the textured side and the reverse was smooth just like other postcards. Due to the use of this paper, linen postcards could be printed with brighter inks creating vibrantly colored images making them a huge advancement over the earlier white border postcards. Linen postcards' heyday was from the years of the 1930's when they were introduced through 1945. They were the principal kind of postcard made during this time because of emerging equipment. It allowed production of linen postcards to be more economical in view of the fact that printing costs in Europe were becoming prohibitive because of tariffs. In the beginning, linens maintained the white border look along the edges of the card. Gradually disappearing as manufacturers started printing the image all the way to the card's edge. Somewhere around 1939, Photochrome or "chrome" postcards came into existence as new advancements became available. Chrome postcards gained popularity after 1945 and linen postcard manufacturers either changed over to this new technology or closed shop. However, some linen postcards were still produced until the late 1950's and early 60's. One of the best-known publishing firms of quality linen postcards was Curt Teich. Although the company originated back in 1898, they gained recognition with their imaginative depictions used on their linen postcards. One type of card that proved very popular even to this day was their "Large Letter" postcard that spelled out the name of a location, such as, a city or state. Inside over-sized, three-dimensional letters were contained little pictures depicting various aspects of the card's topic. Linen Postcard's subject matter runs the gamut from interiors to town and scenic views to buildings to comic. Some of the more sought after topics are roadside establishments like motels, diners, bus and gas stations. Clearly linen postcards are reminiscent of a specific and significant era of American culture providing the collector with a warm sense of nostalgia. Advantages in collecting linen postcards are that they are readily available and reasonably priced. Due to their considerable number, it is recommended that the collector focus on obtaining cards in mint condition with attractive topics, which should be reasonably easy. Thus allowing a collector with a limited budget to establish a beautiful and possibly a substantial collection. From a 1936 advertising flyer from the Broadway Theatre in Kingston, New YorkI rearranged the graphics and did some negative to positive conversion to enhance it.The caricatures must have been provided by 20th Century Fox's publicity department. 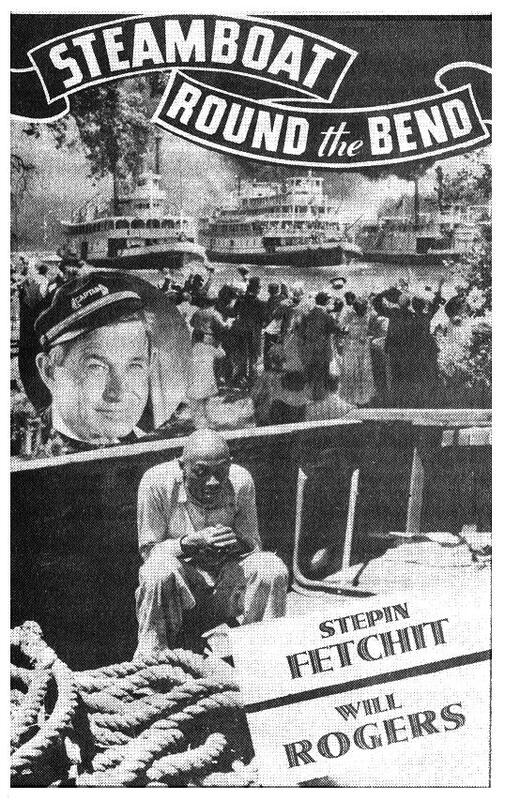 in 1934 which was based on a novel by Paducah, Kentucky native, humorist, novelist and actor Irvin S. Cobb (who played Cap'n Eli in ROUND THE BEND). 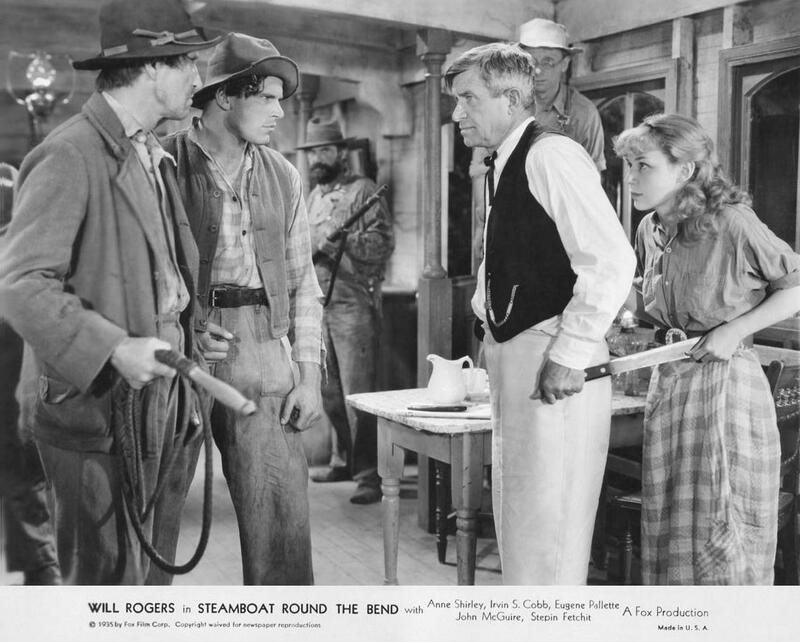 Will Rogers played the title role of Judge Priest in the film and it was directed by John Ford. 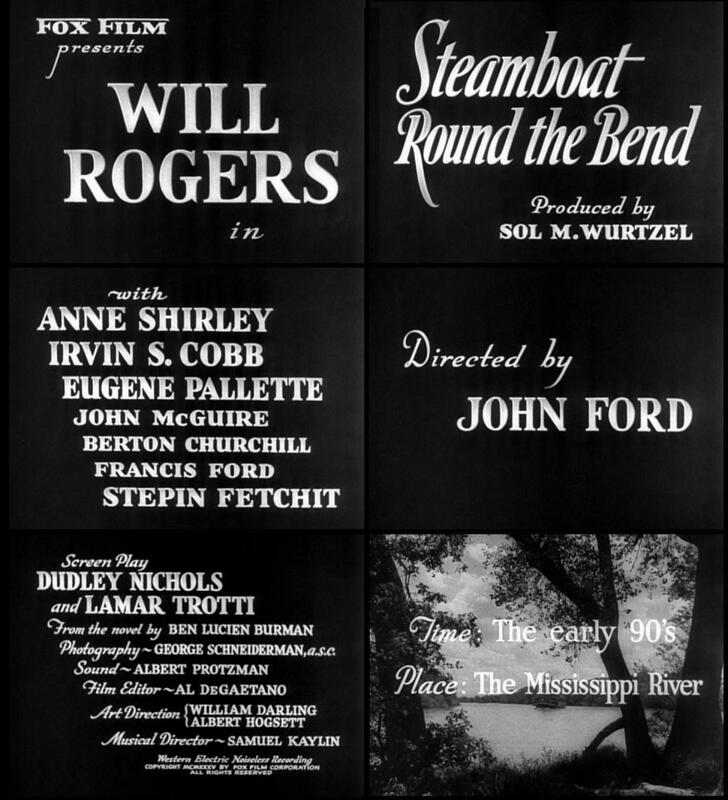 In addition to STEAMBOAT ROUND THE BEND, Nichols worked on 12 other screenplays for director John Ford including THE INFORMER (1935) and STAGECOACH (1939). Nichols was under contract at Fox (1929-35) and RKO (1935-38 and 1943-47). Nichols was the first Academy Award winner to refuse the Oscar when he won Best Screenplay for John Ford's THE INFORMER (1935). He declined the award because of antagonism between several industry guilds and the academy over union matters. Before becoming a screenwriter, Nichols was a star reporter and feature writer for the New York Post. "It is the writer who is the dreamer, the imaginer, the shaper. He works in loneliness with nebulous materials, with nothing more tangible than paper and a pot of ink; and his theatre is within his mind. He must generate phantoms out of himself and live with them until they take on a life of their own and become, not types, but characters working out." Author and screenwriter, often preoccupied with American history as viewed from a Southern perspective. Born in Atlanta, Georgia Trotti studied writing at Columbia University and was also the first person to graduate from the University of Georgia's Henry Grady School of Journalism. In 1923, he became the youngest editor employed by a newspaper owned by the Hearst Press, The Georgian. From 1925, Trotti worked in New York for the Motion Picture Producers and Distributors of America, moving on to Hollywood in 1932. He spent virtually his entire career at 20th Century Fox as writer/producer, from 1933 until his untimely death in 1952. He wrote screenplays for a wide range of genres, including war films, westerns, comedies and biopics. The majority of these were critical and box office hits. Recurring motifs in Trotti's work are life in a romanticized Deep South such as STEAMBOAT ROUND THE BEND (1935), CAN THIS BE DIXIE? (1936). He wrote the script for John Ford's YOUNG MR. LINCOLN (1939) which starred Henry Fonda in the title role Trotti's screenplays benefited from a profound knowledge of American history and politics and his keen eye for characterization. His peers in the industry regarded Trotti as a man of considerable integrity. He was generally described as of quiet, self-effacing nature, possessed of strong moral convictions. His contributions were recognized thirty-one years after his death with a prestigious Screen Laurel Award from the Writer's Guild of America.